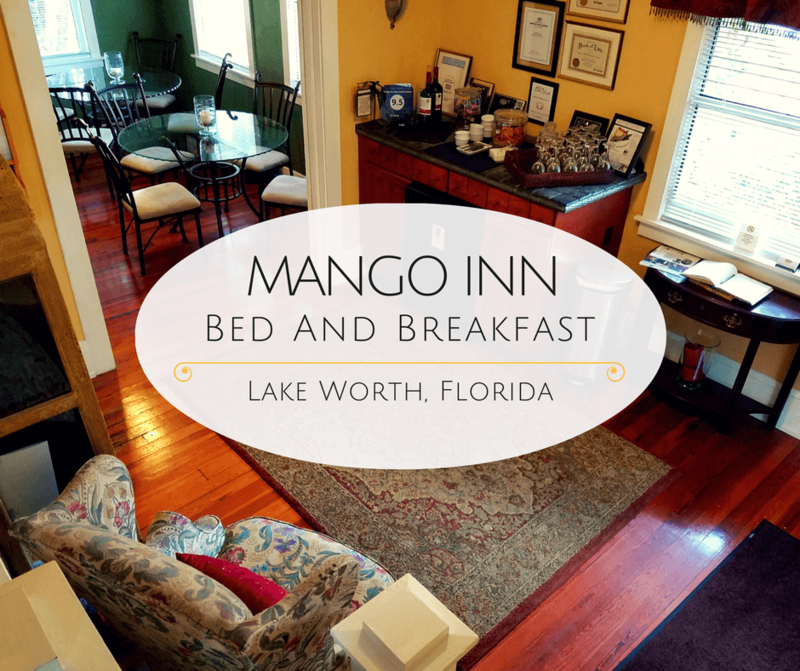 Snuggled up on a quiet street between tall and lush trees is the Mango Inn Bed and Breakfast in Lake Worth, Florida. This secluded inn is perfect for a relaxing getaway, but still conveniently close to many beaches, restaurants, and shops. We had never been to Lake Worth before, so when an opportunity arose for us to visit the Palm Beach County city and have a “Foodcation” there, we jumped at the chance. With the Mango Inn as our home base, we got to explore the area and it’s many local eateries both on our own and also through a food tour with Taste History Culinary Tours. The bright yellow exterior welcomed us like a warm smile, while the sounds of fountains and swaying palm fronds began to lull us into a peaceful state of mind. As we walked up to the front door, we could already feel the stress of the work week melting away. Once inside we were greeted by Brenda, one of the innkeepers. As soon as she started showing us around the house, we were smitten! It had such great character and we loved that the old wooden floors creaked as we walked. Fun Fact: The Mango Inn is actually considered to be one of the oldest homes in Lake Worth. It was built in 1915 and was once the home of one of the Mayors of Lake Worth. Brenda showed us the sitting area (there’s a mini fridge that’s always stocked with wine! ), the pool, and the veranda where breakfast is served every morning. She also let us know that if we wanted to go over to the beach, there were towels and beach chairs that we could borrow. There are 7 rooms in the main building, and some rooms that are poolside. We stayed in one of the cottages, which was off to the side. Our home for the next two days had a living room, awesome kitchen and dining area, two bedrooms, two bathrooms, a washer and dryer, and a backdoor that led to its own small patio. Oh, and did we mention there was a porch swing in front of the cottage? We were feeling so spoiled! The couch in the living room was really comfy and we relaxed on it one night while watching TV (they had a big range of cable channels!). We were also impressed with the kitchen that came stocked with some cookware and utensils. The bathrooms were a little small, but they did have toiletries like soap, shampoo, and even a bathrobe! After a very peaceful night, it was wonderful to walk back into the house and start our day with a gourmet breakfast. Both mornings there were breads, cereals, fruits, and yogurts laid out but Brenda prepared special treats for everyone as well. One morning we had an omelette and the next morning we had french toast stuffed with peaches and whipped cream. Everything was made fresh, on the spot, and tasted delicious. So we would definitely recommend staying at the Mango Inn. We loved that it was only a 10 minute walk to all of the shops and restaurants in downtown Lake Worth, but still felt so secluded. It’s location in the Parrot Cove neighborhood really does make it perfect for a quiet and relaxing weekend. That breakfast is worth staying for alone! Yum! What a beautiful guesthouse. I’ll be sure to check it out if I’m ever in the area. Almost a century, unbelievable. I love sites that are a symbol of history. This is my way of living in the history. The name is also unusual. I loved reading it. A foodcation, what a great term, that perfectly describes my travel style. Not sure how much food tasting I’d be able to fit though after that yummy looking french toast. This place looks great! I love all the history behind it. I’ve never visited Florida but I’ll have to keep this place in mind for when I do. The Mango Inn looks perfect for a weekend getaway! It looks so cozy and I love the yellow paint as it gives off a calming vibe. Thanks for sharing, Vicky! We loved the yellow too! It is really cool that the building has survived 100 years of hurricanes and general Florida weather. It looks that a cute place to spend a few days relaxing in Florida. I would definitely look into staying here next time I am in Florida. Thats no inn! That looks more like a five star hotel. I love that monkey buddy of yours. Happy travels! Wow, the inn looks so modern and relaxing. I have been thinking about escaping to the warmth of Florida for relaxation. This is a nice idea for a staycation. For a b&b it’s a very nice place! It’s more like a hotel, with such touches as the embroidered bathrobe and the quality of breakfast. Very much the kind of place I’d love to stay in. Yes, those kinds of personal touches really made the B&B special! The Mango Inn..Very classy! Thanks for sharing. Beautiful review of the historic Mango Inn Bed & Breakfast in Lake Worth, Florida. The Mango Inn captures the charm in Lake Worth, Florida. The family-run B & B makes everybody feel right at home.